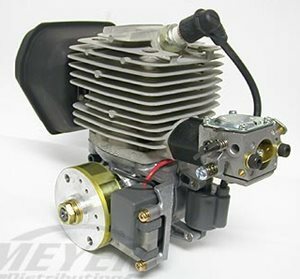 Many RC model gas engines have started using electronic ignition. Up to now, all small 2 and 4 stroke engines have used a magneto ignition system – which is better for gas RC helicopters? Let’s look at how each work and then you can decide for yourself. This type of ignition has been used for decades. It works by using two magnets placed in a non magnetic (aluminum or plastic) rotating drum that is attached to the crank shaft of the engine. On some air cooled engines, thus drum generally doubles as the cooling fan as seen in the above photo. Most model aircraft engines however have external cooling devices such as propeller airflow over the engine on airplanes, or external cooling fans on helicopters. The drum on these engines are much smaller and usually placed on the front or back of the engine, driven by the crankshaft as shown in the photo to the right. The second component in the system is a "U" shaped pickup coil. This coil is mounted at the proper location to induce a voltage spike as the magnets pass by it. This small voltage spike is stepped up in the secondary windings of the coil to around 20,000 volts to fire the spark plug. The secondary coil can either be combined with the primary coil in the pickup, or can it be an external secondary coil. 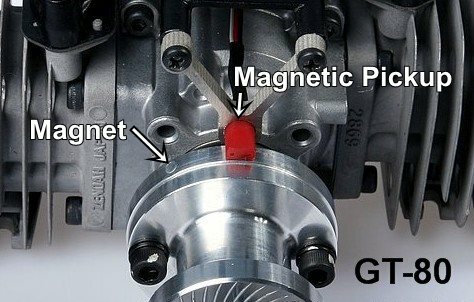 The distance or "air gap" that the pick up coil is set away from the magnets is adjustable and allows you to fine tune the ignition timing on your model gas engine. There are three problems with magneto ignition however. Weight – the magnets and coil are heavy, not a big deal on your lawnmower, but certainly an issue with an RC aircraft. Harder Starting – Unless the magnets are passing by the coil at a sufficiently high enough speed, the coil won’t produce enough voltage to give a strong hot spark. Ignition timing also adds to hard starting, that is the next point. Ignition timing can not be changed as the engine speed changes. Most magneto ignition systems will be set up for the best compromise of engine performance and starting ease. Ignition timing is a topic in itself, I won’t bore you will all the details – this is just a very quick explanation. You might think that a spark plug always fires when the piston is right at the top of the cylinder, we call this top dead center or TDC for short. This is not the case however, as the engine speed changes this timing should also change to get proper combustion. Ideally we would like the spark to occur just after TDC when we are starting the engine. This makes starting easy and saves our hands from the dreaded kick back that occurs when the spark fires before TDC. Once the engine is running however, as we speed it up the spark has to occur before TDC (we call this advancing the timing). Why – ignition just doesn’t happen instantaneously, it takes time. This is why the faster the engine is running, the sooner or more advanced the spark has to occur before TDC. By the time the piston reaches TDC, the air fuel mixture will have been completely ignited and just then starts to expand pushing the piston down. If the ignition happened right at TDC with our engine running at high speed, the piston will be a good distance down in the cylinder before the air fuel mixture starts expanding – yup, lots of wasted power. As we indicated above, magneto ignition systems are usually set for the best compromise between okay starting and good high speed efficiency. For model gas engines in RC helicopters, this is not too bad a compromise seeing that we rarely run at full throttle and all out maximum power is not as important to us "rotor heads". For model gas engines in RC airplanes however, full throttle power is very important. Starting can be difficult and dangerous kick back is always in the back of your mind if you are hand starting. Most "prop heads" will usually set the ignition timing for better high speed performance and give up slightly safer starting. Yes performance is more important than fingers – thank goodness for chicken sticks and electric starters. Some people think the big advantage with electronic ignition is to save weight. 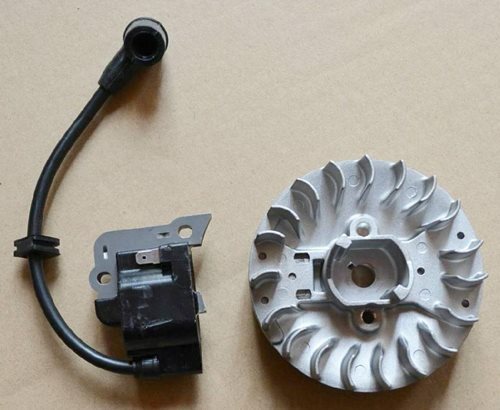 While it is true that replacing the magnets and the pick up coil with an electronic pick up and control module will make the model gas engine about 10% lighter – they don’t take into account the added weight of the battery pack that powers the system. This actually will add more weight to the model than is saved. As battery technology improves however, there will most definitely be weight savings. I have seen some advertisements claim electronic ignition is more dependable and reliable than magneto ignition. That is a pretty bold statement seeing that magneto systems are almost bullet proof and don’t rely on a separate power source. Magnetos have been proven time and time again in every thing from your riding mower down to your weed whacker. While I will recognize that electronic ignition will give a smoother running engine; I don't buy they are more dependable or reliable - but hey, that is just my own opinion. Why bother with electronic ignition? Stronger higher voltage sparks – especially while starting. The most important reason – variable ignition timing. With electronic ignition there are no more compromises. The timing is set after TDC when we are starting and as the model gas engine speed increases, the timing is advanced. These are the real benefits that you get with electronic ignition. Theoretically, there should also be less vibration at idle because you will have eliminated the small amount of pre-ignition that occurs with advanced timing. Electronic ignition has allowed 2-cycle model gas engines to approach the power output of similar sized nitro engines; however they are still heavier. So how does electronic ignition work? There are three parts to an electronic ignition system for model gas engines. First is a small pick up device that registers the exact position of the crank shaft. This can be done with an optical pick up, but the preferred and best method is by using a magnetic Hall Effect pick up sensor. I am not going to explain what Hall Effect is or get into the Lorentz Force; you can look those up on your own. The pick up sensor will let the control module know when the piston is at TDC and also how fast the engine is spinning. The second part of the system is the electronic ignition module. The module receives the signal from the pick up sensor and determines when to fire the spark plug. Amplifier circuitry is used to step up the input voltage from around 5 volts to over 20,000 volts to produce a nice hot spark at the plug. The timing of this spark is constantly changing depending on the engine speed according to the spark timing algorithm in the control module. I should also mention much of the circuitry in the ignition module is to help filter and suppress electrical noise (radio noise) to help prevent interference. We have already identified the third component of an electronic ignition system on a model gas engine - the battery to feed power to the control module. Most RC model gas engines with electronic ignition will use a 4.8V receiver battery pack. The control module will use about 300-600mA of power so most manufacturers recommend using at least a 2400mAh battery. This will give you over two hours of flight time per charge, roughly the same as your receiver battery. You can not use a bigger battery to power both your receiver and ignition system. Even though the control module has filtering circuitry, stray electrical noise will be transmitted into the battery and then into your receiver – down you go! I hope this explanation “sparked” your interest, sorry more bad humor. Electronic ignition certainly solves some big problems at the expense of another battery pack, added weight, and perhaps reliability. Magneto systems have proven themselves for decades and are tough as nails but are not as efficient, and can be slightly harder to start. 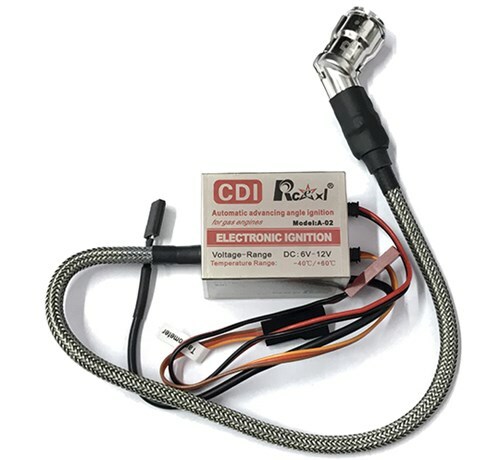 Deciding on what the best ignition system is for your model gas engine will ultimately depend on what you deem most important.